A: According to the American Optometric Association (AOA), infants should have their first comprehensive eye exam at 6 months of age. After that, kids should have routine eye exams at age 3 and again at age 5 or 6 (just before they enter kindergarten or the first grade). A: Yes. School vision screenings are designed to detect gross vision problems. But kids can pass a screening at school and still have vision problems that can affect their learning and school performance. A comprehensive eye exam by an optometrist can detect vision problems a school screening may miss. Also, a comprehensive eye exam includes an evaluation of your child’s eye health, which is not part of a school vision screening. A: Vision therapy (also called vision training) is an individualized program of eye exercises and other methods to correct vision problems other than nearsightedness, farsightedness and astigmatism. Problems treated with vision therapy include amblyopia (‘lazy eye”), eye movement and alignment problems, focusing problems, and certain visual-perceptual disorders. Vision therapy is usually performed in an optometrist’s office, but most treatment plans also include daily vision exercises to be performed at home. 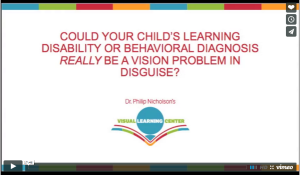 A: No, vision therapy cannot correct learning disabilities. However, children with learning disabilities often have vision problems as well. Vision therapy can correct underlying vision problems that may be contributing to a child’s learning problems. A: In most cases, it just takes awhile for a toddler to get used to the sensation of wearing glasses. So persistence is the key. Also, you may want to put his glasses on as soon as he wakes up – this will usually help him adapt to the glasses easier. A: With proper treatment, the odds are very good. Many researchers believe the visual system can still develop better visual acuity up to about age 8 to 10. If your daughter’s eye turn (strabismus) is constant, it’s likely surgery will be necessary to straighten her eyes in order for her therapy for amblyopia (or “lazy eye”) to be successful. Strabismus surgery may be needed even if her eyes alternate in their misalignment. See a pediatric ophthalmologist who specializes in strabismus surgery for more information. A: We can perform a very simple stereopsis test to determine if your daughter has normal depth perception. In this test, she wears “3-D glasses” and looks at a number of objects in a special book or on a chart across the room. If she has reduced stereopsis, a program of vision therapy may help improve her depth perception. A: Rigid gas permeable (GP) contact lenses may help. Research shows that, in many cases, fitting myopic youngsters with GP lenses may slow the progression of their nearsightedness. There’s also a special fitting technique with GP contacts called orthokeratology (or “ortho-k”) that can even reverse certain amounts of myopia. There is also research that suggests bifocals and/or reading glasses may slow down the progression of myopia in some children. A: Convergence insufficiency (CI) is a common learning-related vision problem where a person’s eyes don’t stay comfortably aligned when they are reading or doing close work. For reading and other close-up tasks, our eyes need to be pointed slightly inward (converged). A person with convergence insufficiency has a tough time doing this, which leads to eyestrain, headaches, fatigue, blurred vision and reading problems. Usually, a program of vision therapy can effectively treat CI and reduce or eliminate these problems. Sometimes, special reading glasses can also help. A: Usually, 5-year-olds can see 20/25 or better. But keep in mind that visual acuity testing is a subjective matter – during the test, your child is being asked to read smaller and smaller letters on a wall chart. Sometimes, kids give up at a certain line on the chart when they can actually read smaller letters. Other times, they may say they can’t read smaller letters because they want glasses. (Yes, this happens!) Also, if your son had his vision tested at a school screening (where there can be plenty of distractions), it’s a good idea to schedule a comprehensive eye exam to rule out nearsightedness, astigmatism or an eye health problem that may be keeping him from having better visual acuity. A: In situations like this, where one eye needs a much stronger correction than the other, contact lenses are a better option. With glasses, the unequal lens powers cause an unequal magnification effect, so the two eyes form images in the brain that are different in size. This can cause nausea and dizziness because the brain may not be able to blend the two separate images into a single, three-dimensional one. And, of course, the glasses will be unattractive because one lens will be much thicker than the other. For more information on children’s vision , visit All About Vision®.